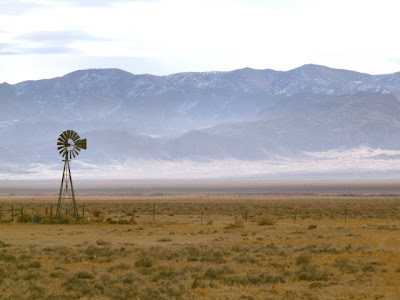 Out on the desert floor I see a windmill, looking lonely out in the desolate brush. 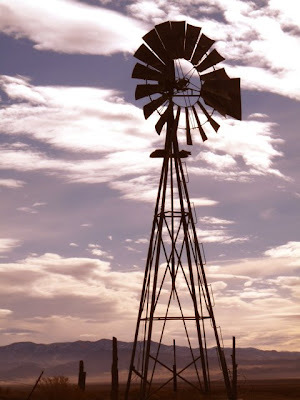 The windmill is a sign of early technological progress--a way to harness the wind to pump water from the ground and provide for livestock, irrigation, or other water needs. 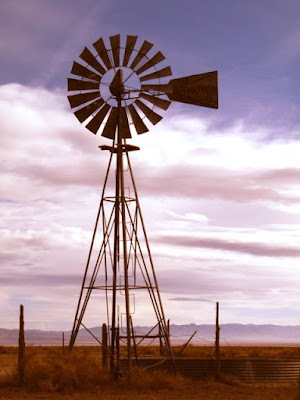 The windmill is an indication of a rural area, a place without electrical lines. Over the last 120 years, the basic design of a windmill hasn't changed much. The fan (or wheel) at the top of the tower is turned by the wind. This rotary motion turns a set of mechanical gears that raises and lowers the "sucker rod," the rod that extends below the fan and down into the ground. The up and down movement of the rod (reciprocating motion) powers the cylinder pump located underground. This cylinder pump is near the bottom of the well, which is dug or drilled into an aquifer. Perforations in the well casing allow water to percolate into the well, and then the pump keeps adding water to the bottom of the pipe, creating enough pressure that the water is forced upwards and out of the pipe. For this windmill, once the water reached the surface, it was put into this livestock tank. Today it's full of tumbleweeds, and none of the similar windmills in the valley are working. It's been quite a few years, even decades, since the last one pumped water to the surface. My husband says he can remember one working windmill as a child. So why aren't more of these windmills, with their simple technology, in use? 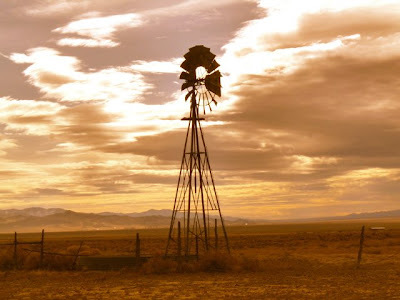 With the arrival of electricity, brought by the Rural Electrification Association from the 1930s to 1950s, windmills all over rural areas went into decline because it became easier to pump water with a motor that had a steady power supply. Nowadays, with increased energy prices, more people are repairing, restoring, and installing windmills, and learning how to maintain them. This windmill is an Aermotor, made in Chicago. 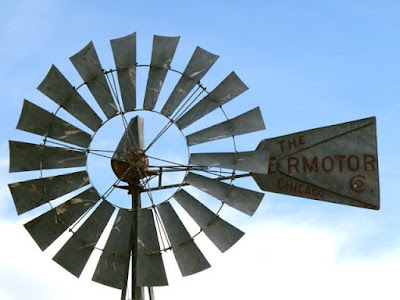 Aermotor windmills were first sold in 1888, and were made in Chicago until 1958. Today they are still sold, made in San Angelo, Texas. I had a little fun with lighting effects. The windmill is a fun subject to photograph. 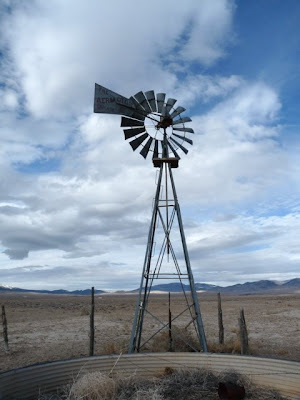 The old timers were on to something, harnessing the free power of the wind to make life easier for them. Nowadays, more and more people are turning to the wind again, not so much to lift water from the ground, but to create electricity. The windmills that are used for electricity are called wind turbines, and we are starting to see more and more of those out in the desert. Lots of recent stories about raw materials for energy production. What gorgeous winter scenery, too. We visited Big Bend National Park several years ago. There were several old homesites that still had working windmills. Talk about an oasis! There going to be putting up 400 ft. wind turbines by us in the Midwest. Lots of controversy. Don't know how they'll affect the ecosystem, but they sure are cool to look at! THIS IS PERFECT !! I had a Windmill at home but my other was so angry with that because she told me it was huge to be there. Beautiful photos. I love photographing them and old barns.